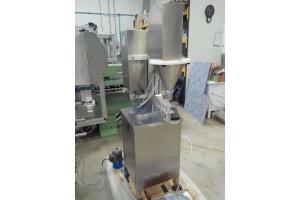 RAV06M is a semi-automatic filling machine (with operator assistance) and represents the entry level in the production line for powder dosing machines. It can be used in the pharmaceutical, cosmetic and food industries for small production batches, but with the same technical and performance characteristics as the most important models and at a relatively low cost. An electro-pneumatic unit lifts the bottle, inserting the dosing terminal inside the container, allowing direct dosage and leaving the machine perfectly clean.